According to one of Ronan Farrow’s Monday guests, the riots in Ferguson, Missouri were justified as “well-placed anger, disappointment, disenchantment with an aggressive militarized police force and with the apathetic government.” Farrow agreed. Farrow’s two guests were Torrine Russell from Hands Up United and Philip Agnew from Dream Defenders. The two are organizing a national day for students to walk out of school in remembrance of Michael Brown. The host asked Agnew about the just-completed funeral of Brown. Agnew called it well-placed anger and followed it with a strange metaphor about making a cake. 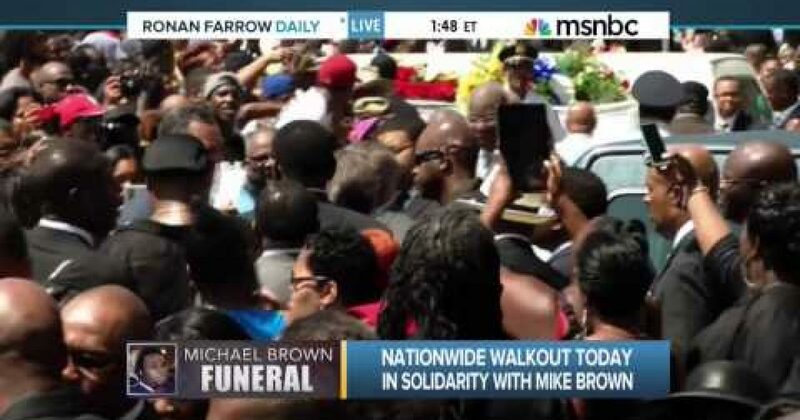 Farrow: And we’re still looking at those live images of people streaming out of the church. Very emotional people. We saw people leaping to their feet angrily, sometimes euphoric at the prospect of change but also still a lot of anger there, and we’ve seen that on the streets. Philip, with so much rage surrounding this, how do you prevent these protests you’re planning from turning violent? Agnew: Well, first, I take issue with calling it rage. I think this is well-placed anger, disappointment, disenchantment with an aggressive militarized police force and with the apathetic government. Let me ask you this. If I give you flour, if I give you eggs, I give you water, I give you milk, will you have a turkey sandwich? No, you have cake. And so the recipe is there. You have no jobs. You’ve got no opportunity. You have got low educational opportunities. And then you combine that with that militarized police force that’s quelling up people who have righteous anger over something anybody should be angry over. I don’t consider it rage at all. I consider it well-placed anger. I think youth around the country are going to conduct themselves in a very orderly manner because that is our nature. It’s only turned violent when the police were in the, when the police in the community, when the police were aggressive, and when they came through a regular city block with tanks like they were in Afghanistan. Farrow: Right. You make an important point about the recipe there, in that community and in so many communities around the country. Rage, anger, something that’s an inevitable product.